D. Crosby Baxter was a jack of many trades, but the one he may have been least adept at has had the most lasting effect on Ridgefield. 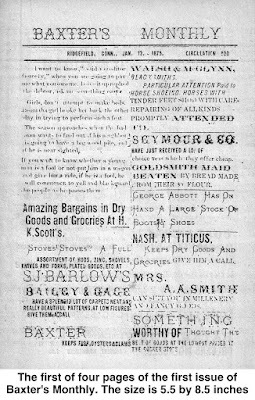 In 1875, Baxter founded the town’s only newspaper. Monthly.” Within two months, the journal was a weekly named The Ridgefield Press. 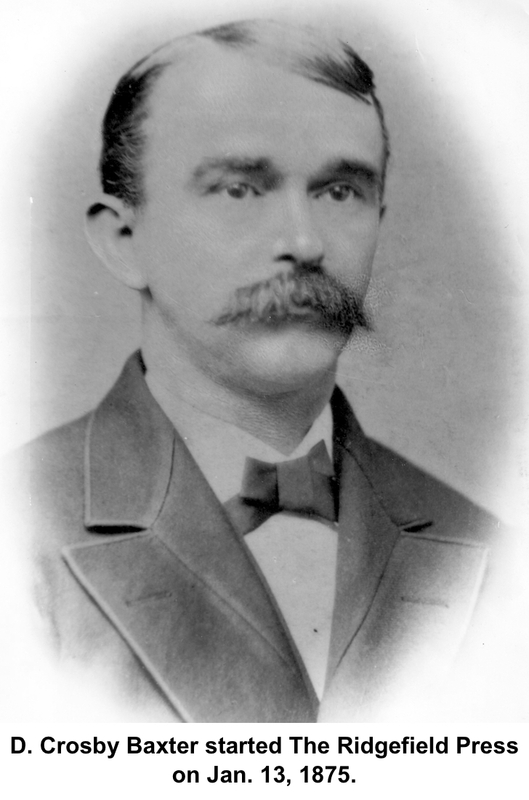 Darius Crosby Baxter was born in Somers, N.Y., in 1842, and moved to Ridgeﬁeld with his parents when he was 11. He started out as a shoemaker, but turned to storekeeping for a livelihood after he lost his left hand in a blasting accident. In 1865, Baxter married Flora E. Farvor of Washington, Conn. They lived for a while on West Lane, later on Catoonah Street, and then in a house he bought on Main Street just north of the building where Planet Pizza is. It was perhaps because of his dealings with fellow local merchants that Baxter realized a need for businesses to get their messages out. In 1875 at the age of 32, with no experience in either printing or journalism, he founded Baxter’s Monthly to do just that. He bought a printing press and began work in his basement. 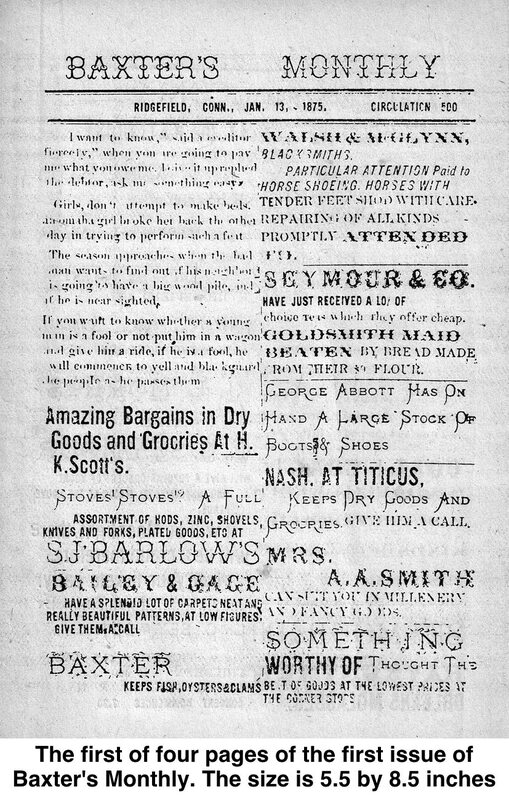 In the early days the paper was full of ads for local businesses but carried little “news.” Issues contained a few local social news items, usually reported in a light-hearted vein, as well as jokes, stories and poems. “The succinct quality of some of the writing may have been occasioned by the fact that every letter of type had to be picked up by hand, and Baxter had not been trained as a printer,” said Karl Nash in a history of The Press. And, of course, he had only one hand to work with. Twenty five years after he founded the paper, Baxter reflected on the early days. “The first paper was printed on a Kelsey press made at Meriden, Conn.,” he wrote in 1900. “It was just large enough to print one page at a time; in fact, I did not have type to print only one page at a time. He got help with the editorial content from folks like Hubert Main, the hymn composer (also profiled in Who Was Who), who would write humorous pieces; Dr. W.S. Todd, a local physician; and Henry Mead, a Main Street businessman. His motto remained in place through the 20th Century, and when the Nash brothers, Karl and John, bought the operation in 1937, they named their company Acorn Press. The newspaper, now part of the multimedia, 12-newspaper Hersam Acorn Network, still has an image of an acorn in the nameplate at the top of the front page. Five years after he began, Baxter moved the operations to the Masonic Hall. (The building next to town hall burned down in the great first of 1895 — but The Press did not miss that week’s issue, which carried extensive coverage of the blaze. A new Masonic Hall was quickly built, and The Press resumed work there, remaining until 1938 when the Nash brothers moved it to its present location in an old automobile garage on Bailey Avenue. By the time Baxter sold the operation in 1880 to Charles W. Lee, The Press was running eight broadsheet pages. Only two of those pages were local news and advertising, however; the rest was “boilerplate” news, features and ads that had been prepared by a company in New York City. Baxter next opened what was to be the town’s first livery stable. There he sold and rented horses, and performed taxi services, such as bringing people from and taking them to the train station on Prospect Street. Twenty five years later, the town had three livery stables. After that, he ran a country market, called the Lakeview Store, on North Salem Road in the Scotland district. Around 1920, when he was in his late 70s, failing health forced him to retire. He died in 1923 at the age of 80.